4/3/2011 – A mate in two, one in three and a selfmate in five. Those were the problems that John Nunn selected from the BPS Championship for our readers. Today we give you the solutions, carefully explained by the winner. It is an ideal opportunity to learn how to approach these otherwise daunting chess problems. And how to deconvolute and generally enhance astronomical pictures. In March John sent three problems for our readers to solve. Now he provides the solution, extensively explained in his trademark didactic style. To get full marks you had to give all these lines. In this selfmate, White plays first and forces Black to mate White on Black’s fifth move at the latest. Black is trying to avoid mating White. Here there are only two Black moves to worry about, 1...hxg1B and 1...hxg1N, since Black’s three other legal moves all mate White instantly. It seems likely that 1...hxg1B will be met by a series of checks ending with a check on e3, forcing Black to play ...Bxe3#. Likewise, the knight promotion will probably be met by a series of checks ending with a check on f3. Let’s first suppose that Black plays 1...hxg1B in the diagram (we don’t know yet what White’s first move is). It seems unlikely that the final check will be delivered with the black king on c5, since it would have to be by Qxe3+, and at the moment there is no need for Black to take on e3 as the king can move to c4 or d6. So probably the king will be chased somewhere making it easier to force the capture on e3. Then it’s a case of looking at forcing sequences of checks to see what comes up. After a bit of trial and error, it should be possible to find the sequence 1...hxg1B 2 Rxc6+ Kxc6 3 c8R+ Kb7 4 a6+ Ka7 5 Qxe3+ Bxe3#. The main trouble here is that this line already works in the diagram, so it gives little clue as to White’s first move, other than that it should not disrupt this pre-existing line. Never a Nunn without an astronomical reference. Chess, problem solving and chess publication is John's "day job". At night (somewhere in the world) he spends his time working with a global network of remotely operated telescope systems. Global Rent-a-Scope (GRAS) allows subscribers to connect to worldwide telescope locations and operate the instruments there. In an article on the GRAS site John explained how image processing can be used to enhance the pictures one takes with the remote telescopes. 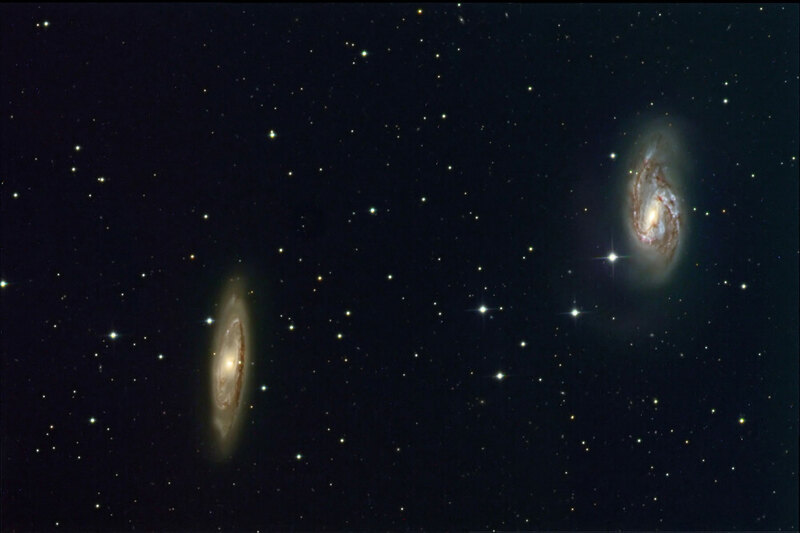 Above is a John Nunn image (which you can click to enlarge) of two galaxies in the constellation Leo, M65 (on the left) and M66 (on the right). This pair represents two-thirds of the famous ‘Leo triplet’, but unfortunately the remaining one (NGC 3628) is too far away to lie in the field of view of the telescope he used, G11. In his GRAS article John tells GRAS visitors how to use deconvolution, a mathematical technique for removing blurring, in order to enhance the images that come out of the telescope, how to combine sub-frames to make a colour image, and how to use other techniques to achieve the perfection you see in the example above. Very instructive. 30.03.2011 – The months of January and February saw two other major solving events. Both were won by John Nunn, a remarkable feat given that he was one of the older participants. John sent us sample positions from both contests, which we passed on to our readers. His explanation of the solutions is possibly even more valuable than the problems themselves. We start with the ISC Solving Contest. 09.03.2011 – The early part of each year involves a busy schedule of events in the problem solving world. We already reported on the Tata Steel Study Solving competition, and the months of January and February saw two other major solving events. Both were won by John Nunn, a remarkable feat given that he was one of the older participants. Report with sample problems. 12.02.2011 – After the success of the first study solving competition held at Wijk aan Zee two years ago (unexpectedly won by Dutch player Twan Burg, with John Nunn second), the event was repeated this year. It was won by one of the oldest participants, none other than the world-class problem solver (and ChessBase photographer) John Nunn. Here's a pictorial report and a sample study to solve. 26.01.2011 – Last week we gave you part one of the solutions to our 2010 Christmas Puzzles, with the didactic explanations of our problem expert John Nunn. Today we bring you part two, with the solutions of puzzles six to eight and the astronomical tiebreakers. We also announce the names of the winners: any solvers from Britain, US, Japan or Israel should go quickly to the solutions and see if you have won. 20.01.2011 – As promised we provide you with the solutions to our 2010 Christmas Puzzles. There were a very large number of entries, and our problem expert John Nunn has put a lot of work into explaining the solutions as lucidly as possible. This made it necessary to split the solutions into two parts, with the second due in a few days. For today here is the first part. 30.12.2010 – The ChessBase Christmas Puzzle week continues, with new problems presented by Dr John Nunn on every day from Dec. 25 to Jan. 1st. You can find them all on the 2010 puzzle index page. Today we encounter the first of the more challenging set, so keep a notepad and pen ready to record your solutions. There will be valuable prizes to be won in the first week of January. Puzzles five and six. 26.12.2010 – The ChessBase Christmas Puzzle week continues with a new problem presented by problem solving world champion John Nunn – this time a selfmate. On a visit to his house on the outskirts of London we gained a preview of his book 1001 Deadly Checkmates, a copy of which will be one of the prizes we offer to best solvers of the Christmas puzzles. But now on to puzzles two, three and four. 11.11.2010 – Last week John Nunn showed us four of the problems that had been given to the participants of this competition that was held on October 19th and 20th in Hersonissos, Crete. They were not easy (it was, after all, a world championship!) and John describes how he went about solving them. And he presents another stunning selection of astronomical pictures. All highly instructive. 03.11.2010 – At fifteen he was Oxford's youngest undergraduate since the 15th Century. He did a PhD on finite H-spaces, lectured on mathematics, and became one of Britain's strongest chess grandmasters. At 55 John's brain is still in top shape, as he showed by winning the problem solving world championship ahead of 70 mostly younger solvers. Truly amazing.